Yarelli Barrera, 13, had occupied her sister and brother-in-law’s bedroom for the past two months and before that, the home of an aunt. The troubles began when the MRI, the X-rays, and the CAT scans revealed that Yarelli had a tumor the size of a golf ball in her knee. That was about the same time that her mother, father, two sisters and she lost their home. The plight of Yarelli’s family came to the attention of Coastal Kids Home Care. The organization was launched in 2005 by its co-founder, executive director, and registered nurse, Margy Mayfield. It provides pediatric in-home care to families who have a child suffering from chronic illness, injury, or a life-threatening condition. Coastal Kids Home Care is the only organization in Monterey County that provides such vital care to children. The local hospice focuses only on adults. Yarelli lay on the bed, her head covered with a knit cap. She was dressed in sweatpants and a pullover. She clung to a light blanket. Crutches were set against the wall. With her mother and sister standing alongside, a reporter introduced himself and asked Yarelli if she would like to share her story. She looked to her mother and her sister, Karen, for help. Karen had broken the ice, but what did this aggrieved young girl have to say about it all. “Did they tell you what was going on?” she was asked. She thought back to that hospital room so many months ago. She shrugged and smiled briefly as if that simple sentence explained it all. When asked “What happened next?” Yarelli waited for her mom or sister to answer, but they urged her to continue. Yarelli spoke of her plight with a calm resignation; but the more she talked, the more strength and fight beneath the surface grew evident. “You have crutches. Were you able to start back to school in September?” she was asked. As it turned out, Yarelli was diagnosed with a mycoplasma infection. In late January, she had to undergo a second surgery to try to clear the bacteria. After surgery, the doctors decided that the remainder of the tumor would have to be attacked with more chemo sessions. Now, six weeks later, these sessions are just one more ordeal that Yarelli has successfully overcome. “I guess I’m embarrassed,” she said with a shy smile. That smile was the perfect cue. “Well, you know what I say to that?” her visitor said. Yarelli laughed right out loud. The reporter finished the interview and thought he had gotten the essentials of Yarelli’s story. He stepped out of the bedroom, into the living room and started talking with Hilda and Karen. The story was just beginning. “So, it’s you and your mom and Yarelli living here; and only one bedroom?” she is asked. Hilda looked at Karen, and Karen explained. Hilda’s motherly eyes welled up and tears came. Later, Karen explained that her father and husband were both working in the berry fields. Hilda and Yarelli’s dad, Israel, had applied to the Housing Authority and to CHISPA for an apartment, but were on the waiting lists. That night, Alfred Diaz-Infante, CHISPA’s executive director, was told about Yarelli and the Berrera family’s living conditions. When he heard, Alfred was concerned and responsive. Two days later, Alfred had news. Hilda confirmed that the couple had been paying as much for their former home — the one the landlord had rented to someone else. The following day, Hilda and Israel Barrera stood at the counter at CHISPA’s office at South Main and Alisal in Salinas. They updated their application with fresh hope that perhaps some relief from their burdens was on the horizon. Kim Hell, a registered nurse with Coastal Kids Home Care, has cared for Yarelli since first starting with the organization last September. During her 10-year career, she has provided direct care in children’s hospitals in St. Louis, Tucson, and Los Angeles. She also has worked in pediatric AIDS research and HIV community outreach and education. She has encountered all kinds of situations, she said. “We see a wide variety: kids with cancer or diabetes, pre-mature babies; circumstances, like Yarelli’s with great hope for the future, and others — unfortunately — beyond treatment. “Generally, we’re there to assess the child’s health, draw blood, provide specific medical treatments; but nursing is so much more than medical procedures. Sometimes we’re teachers, sometimes counselors, helping the family to cope. “The parents know their child, but they may not know how to care for them in the unusual circumstances they find themselves. We teach them what signs and symptoms to look for, so they know when to call the doctor. There observations and actions can often prevent the child from getting worse and having to be hospitalized. A large part of our work is to empower the parent and the child. “Stanford is a long way away for a family struggling with a major illness. Because we’re there in the home once or twice a week, the time in the hospital and the number of trips back and forth to Palo Alto can be greatly reduced. “Yarelli, for example, has had a nasal-gastric tube. It was uncomfortable and at first she kind of fought it. Then we were able to teach her how to insert it herself. She struggled to overcome her fear and the discomfort; but once she learned how, she found that she was in control. She could use it only when she needed it instead of having it there all the time with her having no control. In 2015, Coastal Kids Home Care provided in-home care to 661 children, 80% of whom were under the age of 10. In that year, its nurses and social workers made 4,798 home visits. Kim shared her own 2-day-per-week schedule. She serves approximately 20 patients in any given month with one or two visits each week. It was clear how important these two non-profits — Coastal Kids Home Care and CHISPA — are to the future of Yarelli and her family. 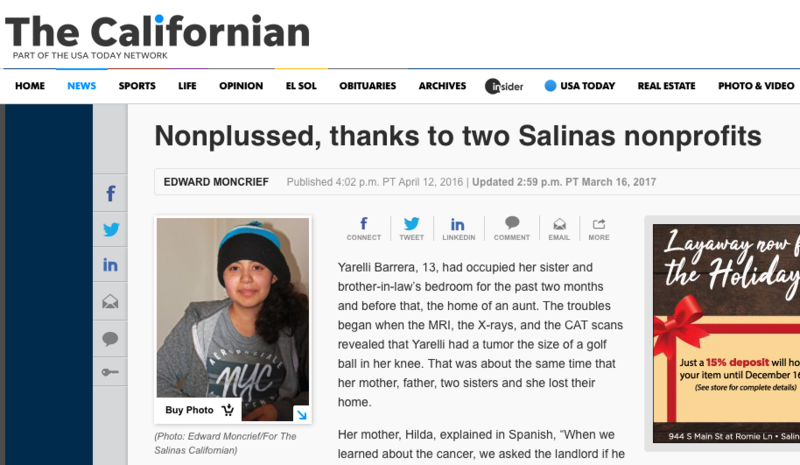 In the coming weeks, The Californian will follow-up with the Berrera family’s story as her parents complete the process of finding an adequate home through CHISPA and continue to receive vital support from Coastal Kids Home Care. In the meantime, one comes away fairly certain that Yarelli will push forward her fight against the disease that has attacked her leg and then confront her coming heart surgery with the same indomitable albeit, at times, shy resolve. A Place of Comfort Meet Christian and Jeremiah.